On September 23, 1215 AD Kublai Khan, the second son of Tolui and Sorghaghtani Beki, and a grandson of Genghis Khan, was born. Considering the Mongol Empire at that time as a whole, his realm reached from the Pacific to the Black Sea, from Siberia to modern day Afghanistan – one fifth of the world‘s inhabited land area. 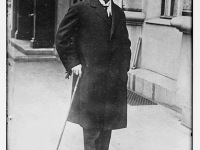 Although the prince had Chinese educators and advisors, he still lived in Mongolia in his youth. When this led to grievances in the administration of his Chinese estates, he moved permanently to China in the 1240s and soon became a representative of Chinese interests. Immediately after the reign of his brother, the Great Khan Möngke Khan, Kublai was appointed governor in northern China; as such he conquered the kingdom of Dali in Yunnan in 1253/54. Already at that time a number of capable officials and also Chinese military men gathered around him, who tried to improve the Mongolian administration in China. Kublai’s relationship to the leading figures in the capital Karakorum, such as Bolgay and Alamdar, was poor, however: the traditionally employed tribal nobility accused him of his China-friendly attitude, so that Möngke temporarily dismissed him between 1257 and 58. In 1257, unhappy with the progress of the war against the Chinese Sung Dynasty, Möngkë led an expedition into western China but was killed by the Chinese defense in August 1259. In 1260, supported by pro-Chinese groups, Kublai was elected as Möngkë’s successor, but his younger brother Arigkbugha, disputed the election and proclaimed himself khan at Karakorum, Mongolia. With the help of the troop leaders assembled in northern China, among them quite a few Chinese, Kublai asserted himself militarily in a fratricidal war lasting four years (1260 to 1264) against the traditionally recruited part of the tribal aristocracy in Karakorum, which had favoured Arigkbugha as the Great Khan. Recognizing the superiority of Chinese thought, he gathered around himself Confucian advisers who convinced him of the importance of clemency toward the conquered. Kublai Khan gradually moved his capital to Beijing between 1256 (when Shangdu began to be built) and 1274 (when the palace complex in Beijing was completed), adopting the Chinese administrative practices and, to a certain extent, their culture. In subduing China and establishing himself there, he alienated other Mongol princes; his claim to the title of khan was also disputed. Though he could no longer control the Mongolian aristocracy effectively, he succeeded in reunifying China, subduing first the north and then the south by 1279. Kublai reunited the country after more than 300 years of division and proclaimed the Yuan Dynasty, the first emperor of which he ruled under the Chinese name Shizu (元世祖). He was also included in the succession of legitimate Chinese rulers. To restore China’s prestige, Kublai engaged in wars on its periphery with Myanmar, Java, Japan, and the nations of eastern Southeast Asia, suffering some disastrous defeats. At home, he set up a four-tiered society, with the Mongols and other Central Asian peoples forming the top two tiers, the inhabitants of northern China ranking next, and those of southern China on the bottom. He recruited men of all nations for his civil service, but only Mongols were permitted to hold the highest government posts. 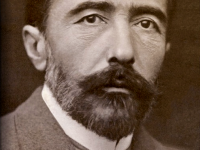 He promoted economic prosperity by rebuilding the Grand Canal, repairing public granaries, and extending highways. Under Kublai, the Mongols adopted divide-and-rule tactics. The Mongols and central Asians remained separate from Chinese life; in many ways life for the Chinese was left basically unchanged. Kublai was also well known for his acceptance of different religions. The rule of the Mongol minority was assured by dividing the population of China into four social classes: the Mongols; the central Asians; the northern Chinese and Koreans; and the southern Chinese. The first two classes enjoyed extensive privileges; the third class held an intermediate position; and the southern Chinese, the most numerous of all, were practically barred from state offices. 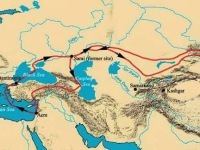 Under Kublai, the opening of direct contact between China and the West was made possible by Mongol control of central Asian trade routes and aided by the presence of efficient postal services. In the early thirteenth century, large numbers of Europeans and central Asians made their way to China. The presence of the Mongol power also enabled many Chinese to travel freely within the Mongol Empire, all the way to Russia, Persia, and Mesopotamia. 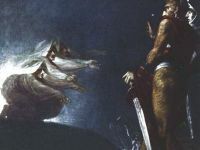 In 1266 Kublai entrusted the Polo brothers, two Venetian merchants, to carry a request to the pope for one hundred Christian scholars and technicians. The Polos met with Pope Gregory X in 1269 and received his blessing but no scholars. Marco Polo, who accompanied his father on this trip, was probably the best-known foreign visitor ever to set foot in China. It is said that he spent the next seventeen years under Kublai Khan, including official service in the administration and trips through the provinces of Yunnan and Fukien. Two Mongol invasions in Japan were unsuccessful in 1274 and 1281, so that the further expansion of the Mongol empire now also came to an end in the east. At the time of his death, the Mongol Empire was the largest territorial entity in world history, covering almost the entire Eurasian continent. The population benefited from an organised civil administration, the effects of which were later summarised by the term Pax Mongolica. Although the Yuan administration also had its downsides, which became visible in Kublai’s last years of life, for example, and did not achieve the prestige of other great Chinese dynasties, it did in any case represent a substantial improvement compared to the policies of the previous grand khans. While still alive, Kublai’s second wife Chabi had great influence on his politics. But after their death in 1281 and the death of Crown Prince Genghingkim in 1286, as well as due to his own illness, Kublai left the government to unpopular minions such as Finance Minister Ahmad Fanakati, Lu Shirong and Senge. Tax increases and inflation as well as 1287 the introduction of new paper money, whose value amounted to only 1/5 of the old one, intrigues in the administration and repeated military expenditure characterized these years. On the other hand, the construction measures on the northern section of the Kaiserkanal were assessed as positive. Kublai Khan died on 18 Feb 1294 in Beijing. 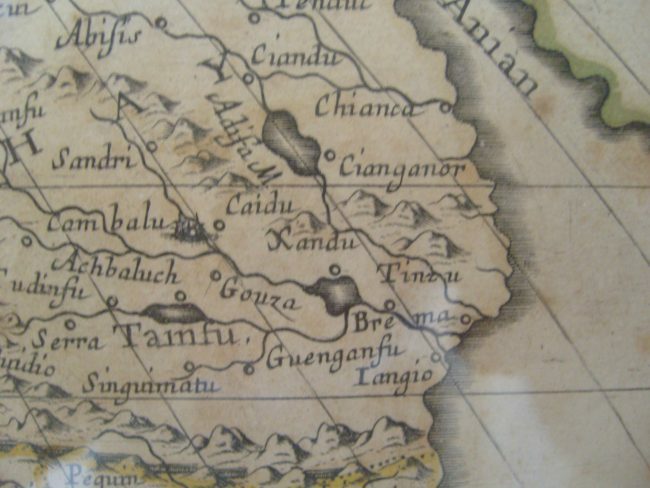 Xanadu (here spelled Xandu) on a map of Asia made by Sanson d’Abbeville, geographer of King Louis XIV, dated 1650. Almost 500 years later, Kublai Khan became also famous in the western world by the 1797 poem ‘Kubla Khan‘ by Samuel Taylor Coleridge, praising the summer garden of Kublai Khan at Xanadu. Moreover, popular culture referred to Xanadu from the poem in Orson Welles‘ 1941 movie ‘Citizen Kane‘. It was the name of Charles Foster Kane’s estate and the lines were quoted right in the beginning of the movie. Don’t forget to mention also Frankie goes to Hollywood and their song ‘Welcome to the Pleasure Dome‘ also referring to the poem. At yovisto academic video search you can learn more about the times of Kublai Khan and the Mongolian Culture in a video presentation by James C. A. Watt from the New York Metropolitan Museum of Art on ‘The World of Khubilai Khan: Chinese Art in the Yuan Dynasty – A Retrospective‘.